Even if you are not particularly interested in archaeology you should still visit the site of Butrint. 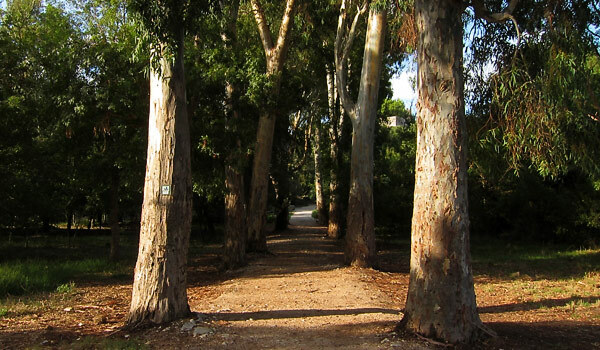 In fact even an accidental visitor will enjoy the peaceful atmosphere, the smell of the eucalyptus trees, and the crickets peeping in amongst the ruins. The site is so complex, with remains dating from so many different periods covering 2500 years, that everyone else is sure to find something which they will remember for ever. You should allow at least 2 or 3hrs for the visit. Thanks to its spectacular position in the middle of a factual ever-green subtropical forrest which includes laurels and tall eucalyptus trees dominating the area, apart from its historical appeal, Butrint is known also from its serene atmosphere. Butrint is located 21 km from Sarande on the southwest coast of Albanian Riviera. Heading south out of Sarande in direction of Greek border, passing through pretty seaside village of Ksamili, after approx. 20 minutes on newly upgraded road, you will get soon to National Archaeological Park of Butrint situated just before the ferry crossing on a low promontory. Known in ancient times as Buthrotum, situated on the Straits of Corfu, and surrounded by a picturesque lagoon, Butrint was an important strategic port. Named a UNESCO World Heritage Site in 1992, the site is one of the most impressive archeological sites in Albania. Thanks to many years of excavation works and also major investments, the site today is a remarkably attractive place to visit. The site has been inhabited since at least 8th century BC. The settlement has soon became a cult site dedicated to Greek god of medicine and healing – Asclepius. In the 1st century BC Ceasar has founded Roman colony at Butrint and later his adopted son Augustus has further developed it, nevertheless for the next six centuries the town has remained a relatively small Roman port. During medieval ages the town was involved in frequent power struggles first between Byzantium and subsequent Norman, Angevin and Venetian kingdoms and later with the Ottoman Empire. 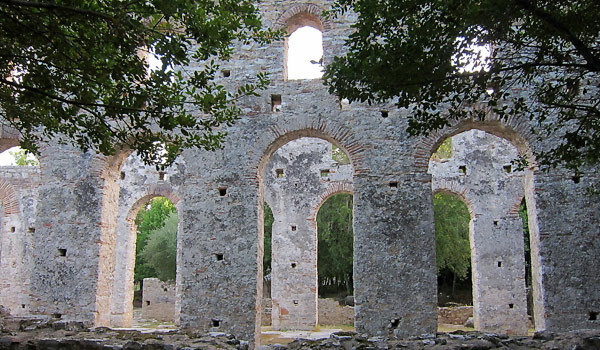 Throughout these times majority of buildings and fortifications in Butrint have been rebuilt and reinforced many times. By the early 19th century Butrint has diminished to a small fishing village scattered around XV century Venetian fortress. Initially constructed in the 4th century BC by the Greeks, with its well-preserved seats and Roman built stage, with a capacity for over 1500 spectators – the stylish theatre still used to this day during summer performances, is definitely one of the site’s most renowned monuments. Another impressive objects of interest in Butrint include the temple of Asclepius; Roman built courtyard houses and bath; the ruins of sizable Byzantine baptistery with well preserved mosaic floor dating to the arly 6th century AD; built around the same time and well conserved 6th century Basilica; and spectacular circular walls dating back from Greek, Roman, Byzantine, and medieval times. 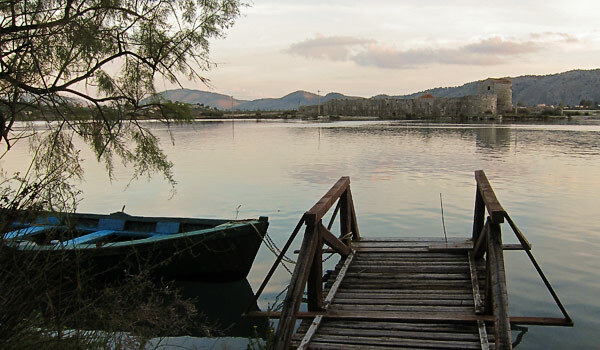 Admission to Butrint is 700 lek for foreigners and 200 lek for Albanians. Price of the ticket also includes entry to the Butrint Museum, which was created in partnership between the Albanian Government and the Butrint Foundation. The museum is located in the castle on the hill, overlooking the entire park. Both the site and the museum are open 09:00 – 16:00 and tourist guides are available in many foreign languages. Ask at the ticket booth for more information. 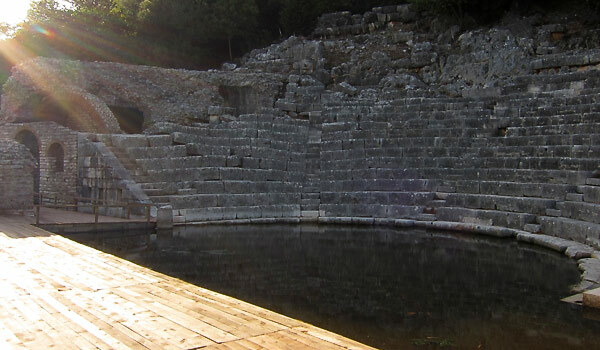 For more information about the site check the excellent Butrint official website. Constructed by the Venetians in the 15th century on the south side of the Vivari Channel and reachable by the ferry platform or by a rowboat, a well preserved fortress known as the Venetian Triangular Castle is rising. Shortly after the castle was built, the old town of Butrint was deserted in its favour. Admission is free. Yet another small structure attributed often to Ali Pasha of Tepelena and located at the mouth of the Vivari Channel is known as the Vivari Channel Fortress. This is a small rectangular fort (22 x 30m) with partially destroyed walls. The fort’s circular walls consist of two shattered towers with firing pits on its sea facing side and two unevenly sized rectangular towers, equipped with firing eyelets and small windows, which are looking up in the direction of the channel and Butrint. Admission is free.